The guitarist has also released ‘Piano Reductions Vol. 2’ with Miho Arai. 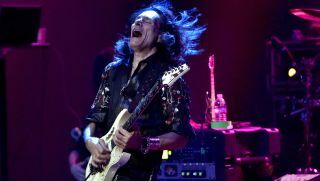 Steve Vai has announced the release of Vaideology: Basic Music Theory for Guitar Players, via Hal Leonard. The guitarist’s first music theory book, Vaideology is geared toward both beginners and advanced players, and takes a deep dive into the basics of music theory and music theory fundamentals, incorporating practical exercises, diagrams, tips, practice methods and various ways of looking at music. Topics covered in Vaideology include: Academic vs. Experiential Learning; Notes on the Neck; Music Notation; Reading & Writing Music; Scales; Intervals; Key Signatures; Circle of 5ths; Chords and Chord Scales; Rhythm Basics; Time Signatures; Guitar Harmonics; Modes and more. Additionally, Vai has collaborated with pianist Miho Arai on Piano Reductions Vol. 2. Said Vai, “I had seen video clips that Miho had made of her performing some of my songs on solo piano from her home on an electric keyboard, and I was blown away. I contacted her and asked if she would be interested in recording this record. Based on the fact that she had my Vai logo tattooed on her neck, I assumed she would be interested in this project, and she was! The complete track list for Piano Reductions Vol. 2 is: “Burning Rain,” “Lotus Feet,” “Lucky Charms,” “Whispering A Prayer,” “The Silent Within,” “The Moon and I,” “For The Love of God,” “Blood and Glory,” “Creamsicle Sunset,” “Dying For Your Love,” “Feathers” and “The Story of Light." For more information on Vaideology: Basic Music Theory for Guitar Players and Piano Reductions Vol. 2, head over to Vai.com.